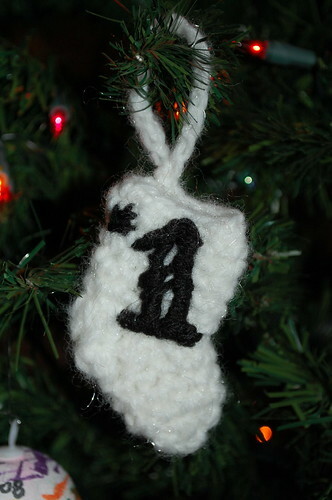 I can’t remember if I even blogged about these last year, but I made more than a dozen of them. They take about ten yards of yarn and about ten minutes – not including end-weaving time, but that’s minimal as there are only two ends – and they are pretty darn cute. I could make five in an hour, end-weaving included, which makes them perfect for seriously last-minute presents or ornamentation. (Random aside, they are the perfect size for holding small, sports-car type Hot Wheels. Out of the package, of course.) Anyway, I ended up not finishing up the directions until after Christmas and I decided I’d just post the pattern right before Christmas this year. Uh, yeah, that worked out really well. Don’t judge me. 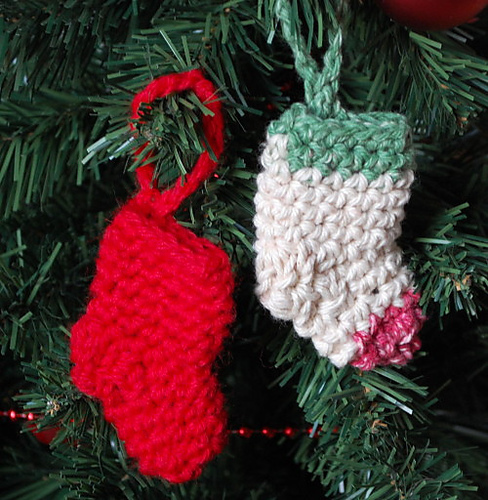 Still, it’s never too late for stocking ornaments, so here’s the pattern! Hanging Loop: Ch 15, sl st in first ch to form loop. Continue. Rnd 1: Ch 12, sl st in first ch (of ch 12) to form loop. Ch 1, sc in each ch around. (12 sc) Join. Rnds 2-6: Ch 1, sc in each sc around. Join. Rnd 7: Ch 2, dc inc in first st, dc in next st, hdc in next st, sc in next st, sl st in next 4 sts, sc in next st, hdc in next st, dc in next st, dc inc in last st. (14 sts) Join. Rnd 8: Ch 2, [dc dec] 2 times, sc in next st, sl st across next 4 sts, sc in next st, [dc dec] 2 times. (10 sts) Join. Rnds 9-11: Ch 1, sc in each sc around. Join. Rnd 12: Sc dec around. (5 sc) Join. Finish off leaving a small tail of yarn; weave tail through last 5 sts. Pull tight, weave in ends. Enjoy! I am teaching my 9 year old granddaughters to crochet and would appreciate any easy and cute patterns for them to do! Thanks! I am expecting my first great grandson! I have never made booties. Do you have a super easy pattern for a first timer? Thank you ever so much!!! I only knit and would love some ornaments patterns for that. I would love some patterns that are free as I am out of work and my husband is also out.